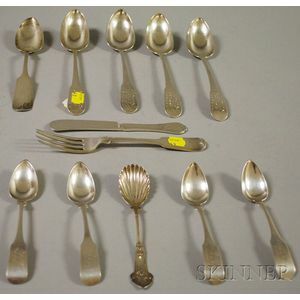 Twelve Mostly New York Coin Silver Flatware Items, including four William G. Forbes serving spoons, four Augustus Mathey teaspoons and a fork, an Andrew C. Benedict serving spoon, and a Ball, Black & Co. spreader, approx. 17.1 troy oz. Four Modern German Violins, c. 1950.